Leeks too often are a sideshow. They are given bit parts in other dishes, usually a soup or a saute. And in the process, all that is wonderful about leeks is lost. So this Thanksgiving, we decided to gives leeks the star treatment. They are deliciously sweet, yet pair wonderfully with so many savory ingredients. They also are easy to cook. Like onions, they will caramelize and soften over a gentle heat with little effort by the cook. 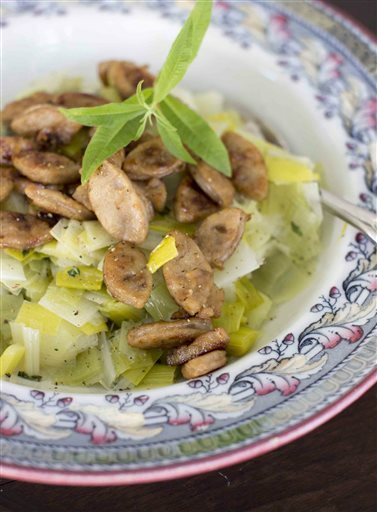 We top our buttered leeks with thinly sliced apple-chicken sausage, a nice accompaniment to the rest of the Thanksgiving meal. Trim and discard all dark green parts and the root ends from the leeks. One at a time, slice the leeks first lengthwise, then crosswise into 1/2-inch-thick slices. Place all the leeks into a bowl, then add enough cool water to cover completely. Swish around, separating the pieces to allow all the dirt between the layers and slices to fall to the bottom of the bowl. Using your hands or a slotted spoon, scoop the leeks out of the water and transfer to a kitchen towel on the counter. With a second kitchen towel, blot the leeks dry. In a large, deep saute pan over medium heat, melt 5 tablespoons of the butter. Add the leeks and cook, stirring occasionally, for 15 to 18 minutes, or until very tender. Stir in the thyme and season with salt and pepper. Transfer the leeks to a serving dish and cover with foil to keep warm. Return the pan to the stove and heat on medium-high. Melt the remaining tablespoon of butter and add the sausage. Cook for 5 to 6 minutes, or until well browned and crisp at the edges. 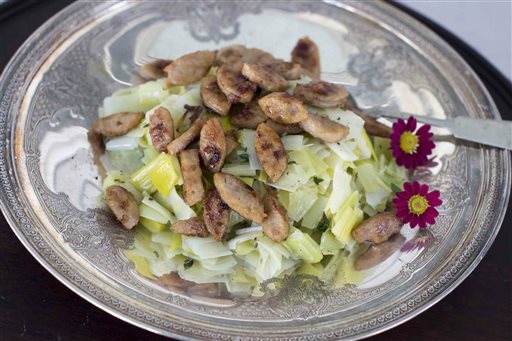 Spoon the sausage slices over the leeks and serve immediately. Nutrition information per serving: 200 calories; 130 calories from fat (65 percent of total calories); 14 g fat (7 g saturated; 0 g trans fats); 70 mg cholesterol; 11 g carbohydrate; 2 g fiber; 4 g sugar; 8 g protein; 470 mg sodium.